The Golden State Warriors have been difficult to peg this season. At times, they’ve looked like their dominant selves, a team on track for a fourth NBA championship in five years. At other times — like Sunday’s stunning home loss to the Phoenix Suns — they’ve looked unmotivated and complacent, like a group that lacks the hunger it had before racking up multiple pieces of hardware. On Wednesday, the former showed up in a big way, pulling out a 106-104 win on the road over the rival Houston Rockets. The win snapped a nine-game win streak from Houston and came with Kevin Durant sidelined with an ankle injury. The win continues a trend of Golden State stepping up on the big stage against tough opponents. Whether that’s a sign of the ability to do so for the playoffs is yet to be seen. Wednesday’s win didn’t come easy. It required the Warriors to hold off a late Rockets surge after leading 100-87 with 5:37 remaining. But they got the plays they needed down the stretch, including a pair of Stephen Curry free throws with 8 seconds remaining. Klay Thompson led the way for Golden State with 30 points and 6 rebounds while DeMarcus Cousins tallied 27 points, 8 rebounds and 7 assists, helping fill the front-court void created in Durant’s absence. Curry tallied 24 points, 5 assists and 4 rebounds, including those late free throws that proved to be the final margin in the game. James Harden paced the Rockets with 29 points 10 assists and 3 rebounds while Chris Paul tallied 24 points, 6 rebounds and 3 assists. With the win, the Warriors (46-21) maintained their first-place pace in the West while fending off the surging Rockets (42-26), who now sit 4.5 games behind Golden State in a third-place tie with the Oklahoma City Thunder. The Denver Nuggets (44-22) are in second place. The Rockets lost in Game 7 of the Western Conference Finals last year while Chris Paul was sidelined and are thought by many to again be the Warriors’ biggest threat in the West. Houston got off to a difficult start this season and has been plagued by injuries to key players. But the Rockets are healthy again and surging, and look every bit the team that can beat a Warriors squad that at times appears to be slipping. 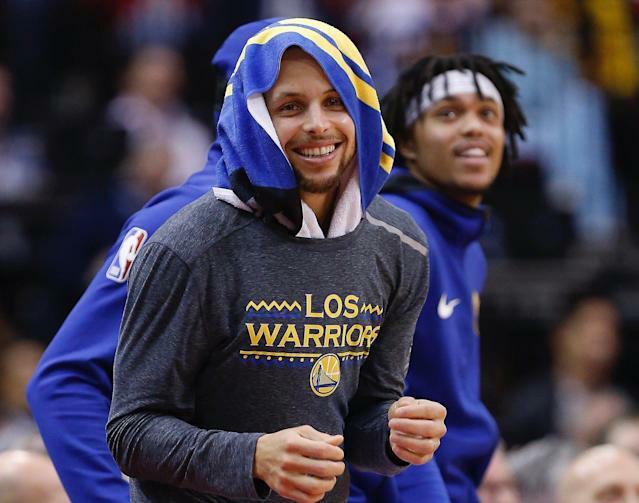 Losses like Sunday’s to Phoenix, a 128-95 drubbing at home last week to the Boston Celtics and back-to-back road losses to the Miami Heat and Orlando Magic in February have fans questioning whether this Golden State team is equipped for the rigors of the playoffs. 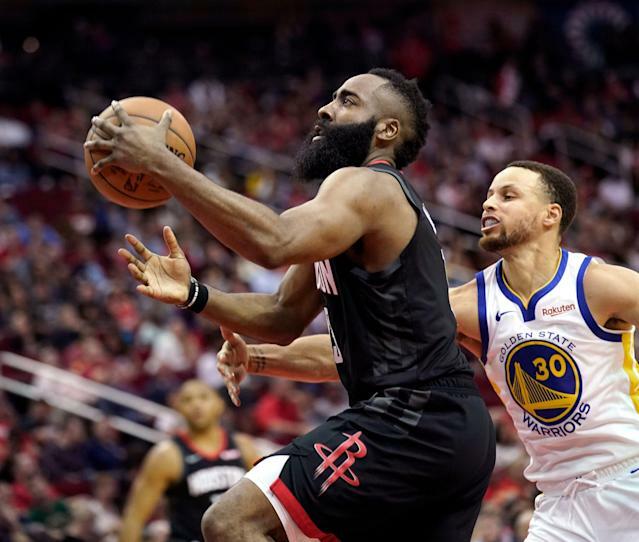 A defensive rating that ranks 15th in the league, far off the pace of the dominant defensive efforts of some past Warriors champions, is also reason for concern. Can Warriors consistently find this gear in playoffs? What quells those concerns are wins like Wednesday’s. And last week’s 122-105 win over the Nuggets. And January’s dominant 142-111 win in Denver when the Nuggets were in first place that defined statement game. The Warriors have repeatedly shown the ability to rise to the occasion in key moments during the regular season when they’ve been doubted. It’s a trend that raises questions. Is it a switch that they can find during the playoffs against Western powers like the Rockets? And if they do is it one they can find again in a potential Finals matchup against a Milwaukee Bucks team that has ruled the regular season?